It had been 6 long hours flying from Toronto to the West Coast. We were just about to make our descent to the San Jose airport. The captain came on the loud speaker to inform us of the balmy temperatures, local time and that we would notice some “haze”. I had watched the news. I knew he was being guarded in not referring to the smoke for what it truly was: the California wildfires raging just North of us. But he wasn’t kidding. 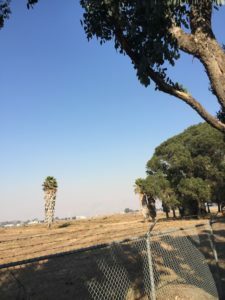 The minute I stepped out of the airport to grab my shuttle to this year’s Transform Our World Global Conference, I was hit with the strange, pungent smell and wispy white haze blanketing the city. There have of course been wildfire disasters closer to home like in British Columbia and Alberta. But it was something I’d personally never experienced before, and this unfamiliar sight and smell coloured my time in San Jose in a way that I was not expecting. And I was expecting a lot. I knew the calibre of the speakers that would be there, I’d had seen snippets of amazing testimony from year’s past, and I went with my own personal affirmation from the Lord that He would meet me there. I knew He wanted to do some work in and through me during this week of international Kingdom connection. So I went with a high level of excitement. I know others did too. While at the conference I met some incredible people who were like who I want to be: ordinary people doing extraordinary things. I talked with folks from Ireland, Norway, Philippines and Uganda. Some had travelled thousands more miles than I had; others came from churches just up the street. I received insight and encouragement and got the chance to reciprocate. I understand now what TC Chairman Derk Maat told me about the conference feeling like family. It was so refreshing to speak with others who, like me, are hungering for more of God’s kingdom to such a degree that they’re willing to have their paradigms shattered and walk out into deeper waters with Him. God’s healing and restorative power was evident all week. If you were watching on social media you witnessed moments like a symbolic reconciliation ceremony between the Jewish, White Anglo-Saxon, Indigenous and African-American cultures that literally made me fall to my knees and weep with its gravity. 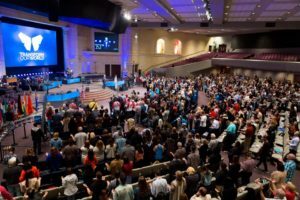 Another moment was the night Bill Johnson spoke and there was an invitation for healing. All sorts of people, including a dear Canadian friend in attendance, received physical healing from various ailments. My friend went down with little mobility and incredible pain in her leg, but was up dancing in the aisles, giving thanks to God for His healing mercy. Seriously, it was awesome to be part of all that. But each day I would walk between buildings to get to the next session, and in the warm glow of the hospitality, camaraderie, and glorious Californian sun I was met by this insistent reminder of trouble and hardship not far away. It actually broke my heart, and on Friday afternoon in the middle of the vast parking lot under the palm trees I wept for the State of California. The beautiful foothills to the East could barely be seen with all the “haze.” I asked a local and she said indeed those foothills would normally be crystal clear. The smell was everywhere: outside the hotel, in the church doorways, in the restaurants and on the shuttle bus. Somewhere people were being evacuated, firefighters were risking their lives, and great damage was being done. It was such a strange duality of emotion: joy in the Lord’s presence and brokenness for the world around me. But I wonder if perhaps that’s what it means to be fully alive in God’s kingdom: complete contentment in Christ and complete discontent with the state of the broken world. The same Spirit that is filling us to overflow with grace, mercy and wisdom to solve systemic problems is the same Spirit that’s prompting us to go out into the world and not hold back what God has deposited in us, deposits that will make an infinite difference in a person’s eternal destiny. That’s why the Bible says don’t grieve the Spirit: he doesn’t fill you with Spiritual fuel just to let you stay in the parking lot. Will we accept the call to go be quenching agents in the social, political and spiritual wildfires of our world? So in the midst of God’s tangible healing power, I was reminded that there is more, so much more to do. While I was expecting a great conference, I ended up getting a whole lot more. I got touched by God’s heart, which extended far beyond the walls of our conference centre, much as it extends far beyond the four walls of our own gathering places back home. And it wasn’t all joy-filled. It was painful, and that empathetic pain mixed with Godly hope brought an urge articulated through the prophet Isaiah: to go and bring comfort to those who mourn, to loose the chains of the oppressed and break every yoke. Will we accept the call to go be quenching agents in the social, political and spiritual wildfires of our world? God wants to restore nations. The conference gave me a chance to see and think on this scale. As I saw the actual fires far in the distance on my plane trip home, it’s true they seemed trivial next the vast landscape surrounding it – much like our current problems in the face of our eternal future. But on the ground, walking among the smoke and knowing people just like me are suffering for it, I am glad for God’s compulsion to go and be a nation changer. There’s nothing ordinary or trivial about that. Eric Ames is the Communications Director for Transformation Canada and one of the 13 Canadians who attended the 2017 Global Transform Our World Conference.